We carry an array of clasps or jewelry clasps in a variety of different materials, styles, shapes and sizes. Clasps are fasteners used in the beading, beadng projects, jewelry making, jewelry designing of necklaces, bracelets, anklets etc. and as other crft supplies in different crafting projects. 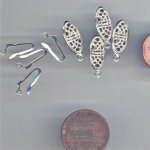 There are single string clasps and multiple string clasps that range from extravagant to very simple for all of your designing needs. Wholesale jewelry clasps, vintage clasps, vintage jewelry clasps, wholesale vintage clasps, beading clasps.